The Marshall Islands, officially the Republic of the Marshall Islands, is a Micronesian island nation in the western Pacific Ocean, located north of Nauru and Kiribati, east of the Federated States of Micronesia and south of the U.S. territory of Wake Island. Bikini and Enewetak atolls are former U.S. nuclear test sites. These tests resulted in the radiation poisoning of 236 Marshallese, and contamination of the island of Rongelap. Kwajalein, the famous World War II battleground, is now used as a U.S. missile test range. The country consists of twenty-nine atolls and five isolated islands. The most important atolls and islands form two groups: the Ratak ("sunrise") Chain and the Ralik ("sunset") Chain. The total land area is 70 square miles (181.3 square kilometers), about the size of Washington, DC. The terrain consists of low coral limestone and sand islands. The highest point is an unnamed location on Likiep at 33 feet (10 meters). Natural resources include phosphate deposits, marine products, and deep seabed minerals. The climate is hot and humid, with a wet season from May to November. The surrounding ocean helps maintain an average temperature of 81° F (27° C). The islands border the typhoon belt. About one-half of the population resides on Majuro Atoll (where the capital Majuro is located), where government employment created a population explosion after independence. The other urban area is Ebeye (Epjā islet), Kwajalein Atoll, where many residents work on the United States military base on nearby Kwajalein islet. The outer islands are sparsely populated due to lack of employment opportunities and economic development. Life on the outer atolls is still fairly traditional, and the nutrition of the rural population, being grown and caught, is superior to that of most of the urban residents, who rely considerably on white rice. Little is known of the early history of the islands. Researchers agree on little more than that successive waves of migratory peoples from Southeast Asia spread across the Western Pacific about three thousand years ago, and that some of them landed on and remained on these islands. Spanish explorer Alonso de Salazar was the first European to sight the Marshalls in 1526, but the islands remained virtually unvisited by Europeans for several more centuries, before being visited by British captain John Marshall in 1799; the islands owe their name to him. Whalers from Europe and the United States were originally attracted to Marshall Islands' waters in the 1830s to 1850s. By the 1860s, the production of copra (dried coconut) dominated European interest in the islands. Spain claimed the Marshall Islands in 1874. Following papal mediation and German compensation of US$4.5 million, Spain recognized a claim from Germany in 1885, and the islands became part of the German protectorate of New Guinea. Trading stations on the islands of Jaluit and Ebon were set up to carry out the flourishing copra trade. Marshallese Iroij (high chiefs) continued to rule under indirect colonial German administration. At the beginning of World War I, Japan assumed control of the Marshall Islands. Their headquarters remained at the German center of administration, Jaluit. On January 31, 1944, American forces landed on Kwajalein Atoll and U.S. Marines and Army troops later took control of the islands from the Japanese on February 3, following intense fighting on Kwajalein and Enewetak Atolls. In 1947, the United States, as the occupying power, entered into an agreement with the UN Security Council to administer much of Micronesia, including the Marshall Islands, as the Trust Territory of the Pacific Islands. 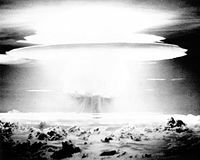 Between 1946 and 1958, the US tested 67 nuclear weapons in the Marshall Islands, including the largest nuclear test the U.S. ever conducted, Castle Bravo, which resulted in the radiation poisoning of 236 Marshallese, and contaminated the island of Rongelap. Nuclear claims between the United States and the Marshall Islands are ongoing: health effects still linger from these tests. On May 1, 1979, acknowledging the evolving political status of the Marshall Islands, the United States recognized the Constitution of the Marshall Islands and the establishment of the Government of the Republic of the Marshall Islands. The Constitution incorporates both American and British political concepts. A Compact of Free Association with the US government was signed, effective in 1986. Marshall Islands' independence was finally realized according to international law in 1990, when the UN officially ended the trust given to the US. Up to 1999, the islanders had received US$180 million for continued American use of Kwajalein Atoll, US$250 million in compensation for nuclear testing, and US$600 million in other payments under the compact. 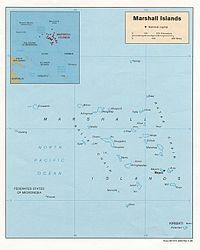 Map of the Marshall Islands. The Marshall Islands has a constitutional government in free association with the U.S. The executive comprises a President, who is both the chief of state and head of government, and who is elected by Parliament from among its members for a four-year term. The President selects a cabinet from among the members of the legislature. The legislature is a unicameral 33-seat body, or Nitijela. Members are elected by popular vote to serve four-year terms. A Council of Chiefs, or Ironij, is a 12-member body comprised of tribal chiefs that advises on matters involving customary law and practice. The judiciary comprises a Supreme Court, a High Court and a Traditional Rights Court. There have been no formally organized political parties. What has existed resembles factions or interest groups because they do not have party headquarters, party platforms, or party structures. There have been a number of local and national elections since the Republic of the Marshall Islands was founded, and in general, democracy has functioned well. The United Democratic Party, running on a reform platform, won the 1999 Parliamentary election, taking control of the Presidency and cabinet. Despite the Constitution, traditional chiefs largely controlled the government until 1999, when, following corruption allegations, the aristocratic government was overthrown. The “commoner” Kessai Note replaced Imata Kabua. Note was was re-elected in 2003. The Marshall Islands has no formal administrative divisions, but the territory is divided into 26 legislative districts, which correspond to the inhabited islands and atolls of the country. A black and white photograph of the Castle Bravo mushroom cloud. United States government assistance is the mainstay of the economy. Direct US aid accounted for 60 percent of the Marshalls' $90 million budget. Under the terms of the Amended Compact of Free Association, the US will provide millions of dollars per year to the Marshall Islands through 2023, at which time a trust fund made up of US' and Marshall Islands' contributions will begin perpetual annual payouts. The government employs 30.6 percent of the work force. The economy combines a small subsistence sector and a modern urban sector. In short, fishing and breadfruit, banana, taro, and pandanus cultivation constitute the subsistence sector. On the outer islands, production of copra and handicrafts provide cash income. Agricultural production is concentrated on small farms, and the most important commercial crops are coconuts, tomatoes, melons, and breadfruit. Small-scale industry is limited to handicrafts, fish processing, and copra. The tourist industry, now a small source of foreign exchange employing less than ten percent of the labor force, remains the best hope for future added income. The modern service-oriented economy is located in Majuro and Ebeye. It is sustained by government expenditures and the US Army installation at Kwajalein Atoll. Marshallese landowners receive rent for the base, and a large number of Marshallese work there. The airfield there also serves as a second national hub for international flights. The modern sector also includes wholesale and retail trade, restaurants, banking, and insurance; construction, repair, and professional services; and copra processing. Copra cake and oil are by far the nation's largest exports. A tuna loining plant employed 300 workers, mostly women. The plant was closed in 2005, following a failed attempt to convert it from producing tuna loins to tuna steaks, a process that requires only half of the employee base. Copra production, the most important single commercial activity for the past 100 years, now depends on government subsidies. The subsidies, more a social policy than an economic strategy, help reduce migration from outer atolls to densely populated Majuro and Ebeye. Marine resources, including fishing, aquaculture, tourism development, and agriculture, are top government development priorities. The Marshall Islands sells fishing rights to other nations as a source of income. In recent years, the Marshall Islands has begun to offer ship registrations under the Marshall Islands flag. The World Bank has declared the Marshall Islands to be the world's best performer for its ease and low expense in hiring and firing employees, but gave low ratings for its protection of investors and contract enforcement. Not belonging to the United Nations International Labor Organization, the Marshall Islands is not obliged to follow labor laws. The islands have few natural resources, and imports far exceed exports. Per capita gross domestic product was US$2900 in 2005. Exports totalled US$9.1 million in 2000. Export commodities included copra cake, coconut oil, handicrafts, and fish. Export partners were United States, Japan, Australia, and China. In that year, imports totaled US$54.7 million. Import commodities included foodstuffs, machinery and equipment, petroleum products, beverages, and tobacco. Import partners were the US, Japan, Australia, New Zealand, Singapore, Fiji, China, and the Philippines. The Marshall Islands has had a rapid population increase, from 43,380 people in 1988 to 60,422 in 2006. Life expectancy for the total population was 70.31 years. The people of the Marshall Islands are of Micronesian origin, which is traced to a combination of peoples who emigrated from Southeast Asia several thousand years ago. The matrilineal Marshallese culture revolves around a complex system of clans and lineages tied to land ownership. Virtually all Marshallese are Christian. Protestants make up 54.8 percent of the population; Assembly of God, 25.8 percent; Roman Catholic, 8.4 percent; Bukot nan Jesus, 2.8 percent; Mormon, 2.1 percent; other Christian, 3.6 percent; other, 1 percent; none, 1.5 percent, according to the 1999 census. A small Bahá'í community exists. Ancient beliefs included a pantheon of chief-deities who once lived and are now represented as constellations. Religious and medical practitioners provided access to life-giving powers. Magic continues to be important in daily life. Elaborate churches have replaced the sacred stones or particular coconut or pandanus trees. Death marks a passage into another form of existence. Non-corporeal ancestors are believed to interact with community members. Both Marshallese and English are official languages. English is spoken by most of the urban population. However, both the Nitijela (parliament) and national radio use Marshallese. Japanese is also occasionally spoken in some areas of Marshall Islands. Marshallese is an Austronesian language that shares characteristics with other Pacific languages, particularly those of eastern Micronesia. Marshallese dialects began to disappear after American missionaries developed a transcription system from 1857. Youths select spouses, but many marriages do not last, according to Carrucci, a Marshall Islands researcher. Stable couples typically live for a period of time on lands of either spouse’s parents, establish ancestral status with the birth of children, and become recognized members of the community. Polygamy was prohibited by missionaries and now is not condoned. Urbanization has created stress in many marriages, and domestic violence is not uncommon. On the outer atolls, marriage provides an entry into the community's system of give and take. Members of one to five households that belong to the same extended family comprise a cookhouse group. One or more respected elders, female or male, head this group. As a rule, the husband provides and the wife cooks. Elevated sleeping platforms have always separated highly ranked family members from others. Marshall Islanders are members of large extended kin groups, linked through shared companionship, shared land, shared clanship (transmitted through females), or shared blood (transmitted through males), according to Carrucci. Land is held in perpetuity by members of clans and extended families, and certain lands and fishing waters are held by the entire community. Land has tended to be passed on from mother to daughter (a matrilineal system). The children of male members of the female line of descent have residence rights as workers of the land. During the American and post-independence eras, pressure has increased to make land available for sale and purchase. Long-term land leases have become popular in Majuro, and a lease that makes the U.S. Army's installation on Kwajalein Atoll possible provides income for the chiefs and land-holders of Kwajalein. Since independence, big differences between the rich and poor have emerged in urban areas. This differentiation not only reflects the distribution of jobs but also the monopoly of political power among a group of chiefs and English-speaking half-caste residents and elite families. The distinction between chief and commoner is long standing. 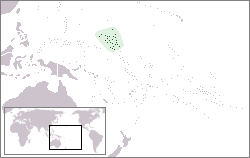 Until the mid-1800s chiefdoms seldom included more than one or two atolls. The power and influence of the chief increased with colonial support. Elders rank above those who are younger and chiefs rank above commoners. Codes of respect and deference are important. Americans are often considered haughty, brash, and irreverent. One should not walk in front of, upwind of, or elevate one's head above the level of one’s seniors. In pre-colonial days, intricate tattoos distinguished people of higher class, including renowned warriors, navigators, and medical specialists, from commoners. Speaking styles are divided into honorific and ordinary styles today. Marshall Islanders commonly wear American-style dress, but elite styles of dress and personal adornment are increasing. Although now in decline, the Marshallese were once able navigators, using the stars and stick and shell charts. They are also experienced in canoe building and still hold annual competitions involving the unique oceanic sailing canoe, the proa. A proa is a multihull canoe consisting of two (usually) unequal parallel hulls, superficially similar to an outrigger canoe. Found in many configurations and forms, it was developed as a sailing vessel in Micronesia, and forms of it may be found as far away as Madagascar and Sri Lanka. The word "proa" comes from "perahu," the word for "boat" in Malay. Since independence, big disparities in wealth have appeared. Majuro has million dollar homes next to run-down and overcrowded plywood and rusted tin dwellings. Those who can afford concrete homes and cars have moved from urban districts (Delap, Uliga, Djarrit) to suburbs that extend from Rairek to Majuro. Meals balance a drink with a food; fish or meat complement the staples—breadfruit, arrowroot, pandanus, and taro, as well as imported rice, flour, and sugar. Indigenous seafoods, birds, and eggs are supplemented with pork, chicken, and an increasing variety of tinned meats. Coffee and cola have replaced coconut milk as the primary drink. While outer islanders still rely on indigenous foods, overpopulation on Majuro and Ebeye means residents rely on imports. Limited affordable imported foods has resulted in high rates of diabetes, heart disease, hypertension, and other diet-related diseases. Infants have few restrictions on their activities, and are nursed until two or three years of age, or until the birth of a younger sibling. They are carried on the hip by working mothers or older siblings. By the age of four or five, children help with babies, run errands, and attend to small chores around the residence. Young boys are free to explore beyond the village, and they go on fishing and gathering expeditions. The public school system provides education through grade 12, although admission to secondary school is selective. The elementary program employs a bilingual/bicultural curriculum. English is introduced in the first grade. There is one post-secondary institution—the College of the Marshall Islands. ↑ Names of the countries of Oceania in local languages, Omniglot. Retrieved November 27, 2011. ↑ Marshall Islands. geonames.de. Retrieved November 27, 2011. ↑ The largest cities in Marshall Islands, ranked by population mongabay.com. Retrieved November 27, 2011. ↑ Department of Economic and Social Affairs Population Division (2009). World Population Prospects, Table A.1. Retrieved November 27, 2011. ↑ Laurence M. Carucci,Marshall Islands. Retrieved November 27, 2011. This page was last modified on 23 August 2018, at 16:07.